Standing cup and cover; silver-gilt; embossed and chased; bowl with wide mouth, cylindrical body and rounded base; formal border with trophies and masks around lip; body with three oval medallions with Bacchus, Apollo and a muse between vases of flowers; lower part with three medallions with busts with masks and flowers between; baluster stem with masks and shells; base embossed with formal scroll borders with cherubs; cover similar with three Cupids with musical instruments; Agnus Dei with cross and flag in centre. Origin: German, perhaps Strasburg; last quarter of 16th century; no marks. Provenance: Baron Anselm von Rothschild, Vienna, between 1866 and 1872 (cat no. 535), by inheritance to his son Baron Ferdinand Rothschild (d. 1898). Commentary: Despite the signs of a slight repair to the stem and the loss of the original finial on the cover, this standing-cup and cover has retained most of its original design and character. Its outstandingly chased, embossed ornament is unimpaired and remains extraordinarily difficult to parallel among the surviving examples of this class. Perhaps one of the most valuable pictorial records of a strikingly similar piece is to be found in the Dutch still-life painting by Clara Peeters dated 1612 (see K. Leuts, ‘Katalog Alte Meister bis 1800’, Staatliche Kunsthalle, Karlsruhe, 1966, p. 236, no. 2222 with illus.). Both the silver-gilt standing-cups with covers in this painting are typically German, strongly influenced by the dominant tastes of the leading Nuremberg goldsmiths of the late sixteenth century. The one in the foreground corresponds with this Waddesdon piece not only in general proportions and overall design but also in its use of the double-stepped foot, the urn-shaped stem with three scrolling brackets and the gently domed cover with an identical rim of classical ornament. Furthermore, it is painted with such meticulous accuracy that the design of the finial - a cylindrical drum surmounted by free-standing scrolling-brackets and a tall figure - can be judged to be a reliable indication of the original that once adorned this cover. Such a tall, graceful finial would have completed the cup's subtle harmony of proportions, with its central vertical axis and its series of strong horizontal divisions incorporating a pronounced waisted bowl with a cylindrical middle zone for the major band of decoration. This formula, already being developed and popularised in Matthias Zündt's ‘Kraterographie’, published in Nuremberg in 1551 (see J. F. Hayward, ‘Virtuoso Goldsmiths and the Triumphs of Mannerism 1540-1620’, Sotheby Parke Bernet Publications, London, 1976, p. 351, pl. 136), had probably been evolved, at least by the previous decade, in Wenzel Jamnitzer's workshop in Nuremberg, if the drawing in the Kunstbibliothek, Berlin (see ‘Wenzel Jamnitzer und die Nürnberger Goldschmiedekunst 1500-1700’, exh. cat., Germanisches Nationalmuseum, Nuremberg, 1985, p. 339, no. 295, with illus.) can be dated, as proposed by Dr Pechstein, “um 1545”. In the Waddesdon Bequest itself, two early Nuremberg examples by Christoph Lindenberger, a contemporary of Wenzel Jamnitzer, can be dated to the 1560s (see WB.101 (cat. no. 15)). In Read 1902 and Dalton 1927, this standing covered cup had been attributed to 'Augsburg or Nuremberg'. However, the absence of marks, together with the very fine quality of the remarkable embossed decoration, may indicate that this covered standing-cup was made in one of the other well-patronised, but perhaps less strictly controlled, centres. A similarly anonymous but equally high-quality standing-cup and cover of the same period and general style has been preserved in the Moscow Kremlin since before 1642 (see G. A. Markowa, ‘Deutsche Silberkunst des XVI-XVIII jahrh, in der Rüstkammer des Moskauer Kreml’, Moscow, 1975, pl. 29, with col. pl. and a detail photograph of the oval reserve in which the theme is music, with a reclining female playing a lute and another singing from sheet music). The Moscow example is taller (H. 90 cm), with a more sculptural and elaborate stem, but much of the embossed detail is very close to the Apollo, God of Music cup in the Waddesdon Bequest. Centres on the Baltic coast, like the Hanseatic town of Rostock, had talented craftsmen working in a closely related manner, as two extant contemporary covered standing-cups from Rostock demonstrate most effectively: one with a hunting scene is in Hamburg (see ‘Goldschmiedearbeiten’, Museum für Kunst und Gewerbe, Hamburg, 1974, p. 77, no. 4, illus. on p. 27) and the other, by Matthäus Vischer, came to Russia from the Schatzkammer of King Christian IV of Denmark in 1628 (see Markowa 1975, no. 22, with col. pl. and two details of embossed figure scenes). Present-day knowledge of the output of these northern German goldsmiths, especially along the Baltic, is so severely hampered by the enormous destruction in succeeding centuries that it is difficult to rule out the possibility that this Apollo, God of Music cup might have been made in the north, although an exact parallel has not yet been found. Another great centre of patronage in the south-west was Strasburg, where the influence of Nuremberg was strongly felt in the sixteenth century and yet where there was a vigorous tradition of individuality and excellence. Two covered cups, both bearing the Strasburg mark (R³ 6970), are valuable comparisons because they are closely dated: firstly, the example in the Toledo Museum of Art, Ohio, USA, is datable between 1555 and 1567, while the second, in the Hessisches Landesmuseum, Darmstadt, is inscribed and dated 1569. Both pieces were included in the exhibition ‘Die Renaissance im Deutschen Südwesten’ at Heidelberg Castle in 1986 (see no. L. 49 (illus. on p. 643) and no. L. 52 (illus. on p. 644), respectively). In the same exhibition there were two further examples, perhaps even more closely related: firstly, the historic Cup of the noble House of Limpurg made in 1561-2 by Christoff Ritter I in Nuremberg, with the cover by the anonymous goldsmith (with the flower punch-mark) of Schwäbisch Hall (no. L. 51, illus. on p. 644); and, secondly, the 1598 cup of Margrave Ernst Friedrich von Baden-Durlach (1573-1638), made in Strasburg by the anonymous goldsmith, S F (no. L. 57, illus. on p. 648). This last-mentioned cup, still preserved in the Neues Schloss (Zähringen Museum), Baden-Baden, has survived complete with its little standing figure at the apex of the cover (total H. of cup 36 cm); in the exuberance of its richly embossed surfaces, combining elaborate scrolling strapwork with figural and animal subjects, this documentary piece provides one of the most significant comparisons. A goldsmithing centre as great as Augsburg might be expected to have had workshops producing covered standing-cups of this design but, whether by accident of survival or a quirk of fashion, the few that are recorded have introduced substantial variations - as in the case of the famous 1583 heraldic cup of the city of Berne surmounted by the Bear holding the armorial shields of the Burgermeister Nicholas von Diesbach and Bernhard von Erlach (Historisches Museum, Berne, inv. no. 2338; discussed and illustrated, with its two companion pieces, in ‘Welt im Umbruch: Augsburg zwischen Renaissance und Barock’, II, Rathaus, Augsburg, 1980, nos 743-5, illus. on p. 367). Although the embossed ornament on this Berne cup has certain stylistic affinities, the comparisons are inconclusive. Similarly, the use of the two-handled vase with three sprays of tall flowers is a motif favoured by Augsburg goldsmiths, such as the maker of the beaker-shaped cup of 1630 in the Museum zu Allerheiligen, Schaffhausen (‘Die Renaissance im Deutschen Südwesten, zwischen Reformation und Dreissigjahrigem Krieg’, Heidelberg Castle, Badisches Landesmuseum, Karlsruhe, 1986, no. L. 64, illus. on p. 652). However, the finely detailed drawings of the bowls of cups, each signed B V (conjoined) and now thought to be the work of the goldsmith Boas Ulrich (1550-1624), do reveal almost as many differences as there are similarities. These rare drawings, preserved in the Kupferstichkabinett at Veste Goburg, illustrate vividly the taste for decorating the waisted middle zone with a single figure within an elaborate strapwork frame (see ‘Katalog Ausgewählte Handzeichnungen von 100 Künstlern aus fünf Jahrhunderten, 15-19 Jh’., Coburg, 1970, no. 34, fig. 31 b; see also, for another drawing, Hayward 1976, p. 239, pl. 184). It is interesting to note that in one of these drawings the helmet and raised sword of the equestrian rider are depicted breaking forward over the frame - just as in the oval reserves on this Apollo, God of Music cup. Boas Ulrich is a rather puzzling figure, although he clearly enjoyed a most successful life as a goldsmith in Augsburg. Born in Nuremberg in 1550, he was evidently trained in Augsburg where he is recorded from 1570 until his death in 1623, and his career illustrates the difficulties of attempting to define too precisely the distinctions between the different major centres in this particular field. He was one of the craftsmen employed in 1591 to make gifts for the Emperor Rudolf II to send to the Ottoman Sultan in Constantinople and later to carry out commissions from the Bavarian Court in Munich but, sadly, almost nothing of his work as a goldsmith can be recognised. However, the question of relating some of the extant unmarked items of plate to a reliably documented Augsburg craftsman of this kind poses insuperable difficulties, and the case for attributing this Waddesdon Cup to an Augsburg workshop cannot yet be proved. Indeed, rather more convincing evidence could be cited in support of the former attribution to a Nuremberg workshop, such as that of Martin Rehlein's beautifully embossed Hans Philipp von Hoheneck cup of 1596 (now in the Thyssen-Bornemisza Collection, Lugano (see Hannelore Müller, ‘European Silver: The Thyssen-Bornemisza Collection’, Sotheby’s Publications, London, 1986, no. 48, illus. on p. 171). Less finely embossed but far closer in form is the covered standing-cup (H. 32.8 cm, in the Germanisches Nationalmuseum) by Gregor Schuelein, who became a Nuremberg master in 1587 (see ‘Wenzel Jamnitzer’ 1985, p. 259, no. 83). Furthermore, a few Nuremberg engraved designs by Paulus Flint's son, perhaps dating from the early 1590s when he was in Vienna, incorporate large chubby putti as well as 'trophies' of musical instruments in conjunction with intricate scrollwork border decoration (see ‘Wenzel Jamnitzer’ 1985, p. 386, nos 411 and 415-16, figs 77-8). Unlike the theme of wine (and Bacchus), music is rarely found as part of the overall embossed decoration on these cups, and perhaps this piece was specially commissioned. Even more unusual is the inclusion of the three heads in roundels below the main cylindrical zone. Hitherto their identity has not been attempted, but perhaps they represent the old man with a young, attractive wife and a wealthy admirer, in which case the masks with horns that fill the intervening spaces are not necessarily purely decorative. The loss of the finial is particularly unfortunate and a more inappropriate substitute, the Lamb of God, could scarcely have been found. 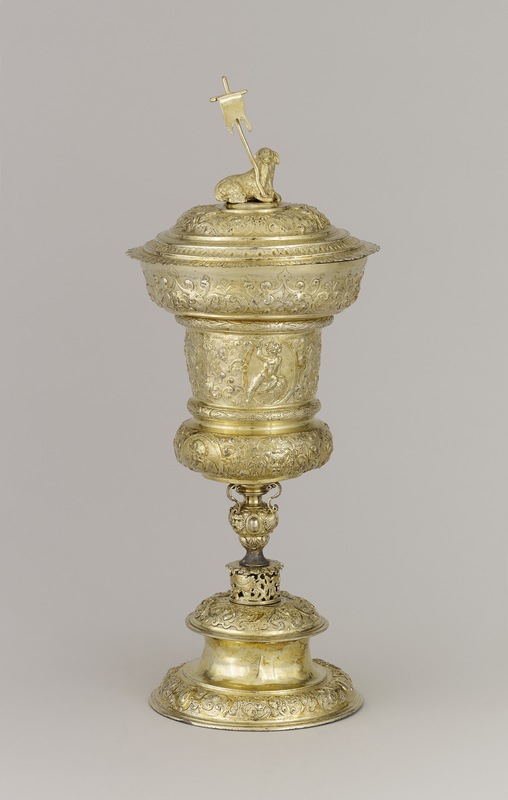 A similar type of recumbent Lamb of God finial figure can be seen on the well-known ecclesiastical covered silver bowl of 1537 belonging to the Pfarrkirche H1. Kreuz in Augsburg (see ‘Welt im Umbruch’ 1980, no. 688, illus. on p. 305). The decision to repair the loss of the original finial by adding an ill-fitting, badly proportioned, religious symbolic figure is strangely insensitive, even prior to 1872, but it may have been chosen if the three heads in roundels were thought to represent a religious subject such as Susanna and the Elders - and, to that extent, may have been thought to harmonise. Franz Schestag, ‘katalog der Kuntsammlung des Freiherrn Anselm von Rothschild in Wein’, zweiter theil, Vienna, 1872, no. 535, with illus. Hugh Tait, 'Catalogue of the Waddesdon Bequest in the British Museum, II : The Silver Plate', British Museum, London, 1988, no. 14, figs. 110-117.